The third workshop about the new consortium for voltage grids of the platform "Flexible Electrical Networks” will take place in Aachen on June 18th and 19th 2015. Based on the last workshops a "four pillar"-concept to fit the needs of the broad variety of interested companies has been developed (see figure). 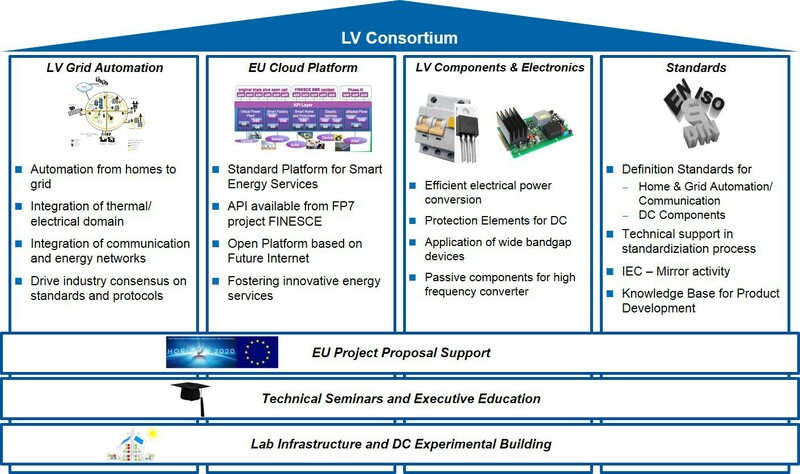 The four pillars are: LV Grid Automation, EU Cloud Platform, LV Components & Electronics and Standards. Regarding the architecture additionally three LV service layers were manifested consisting of EU Project Proposal Support, Technical Seminars and Executive Education and the Lab Infrastructure & DC Application Building. The two-day workshop starts on the first day with the presentation of the future approach on LV topics and a detailed overview of the four pillar-concept. On the second day the workshop will split up into four parallel breakout sessions providing participants an insight view on the topics and the future work. The first partners did already signed to become consortia partners. And you can become part of the platform too! Come to Aachen, get informed and join the platform. More information can be found on the website of the FEN or on the German or English event flyer. Due to great demand where will be two identical workshops. One in June and the other one in May (26.5. - 27.5.2015).